This week is a twofer. I had an idea for a poem come to mind first, then the dialogue followed. 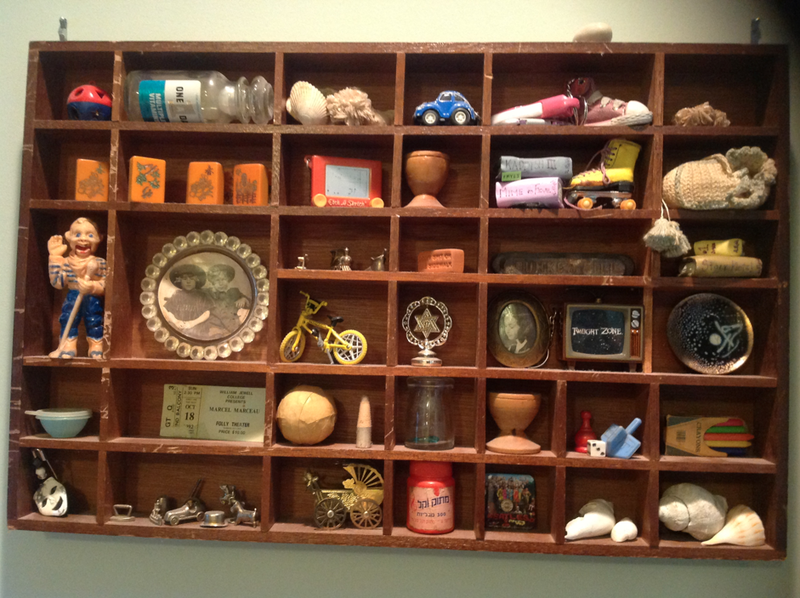 This shadow box reminded me of one my mother had. I saw it as a dust collector, but after she died, I really wanted to ask her about why she’d collected each little thing. What seemed trivial while she lived was suddenly a mystery once she was gone. Ephemera, flotsam and jetsam, the trail left by our lives is easily erased. Happy birthday to Rochelle – and thank you for your willingness to make this happen each week. Friday is also my daughter’s birthday. Happy #22 to you, dear Laurel! childhood flashing by on hummingbird wings. safely stored in shadowy spaces. beacons against the gathering dusk of our days. – Mommy, why do you have a clown in your treasure box? – Well, it reminds me of a fun day I had when I was about your age. – Do you like clowns? – I did then, Honey. Clowns always made me laugh. – Like daddy does now? – Exactly – just like that. This entry was posted in Cancer, Flash Friday Fiction, writing and tagged flash friday fiction. Bookmark the permalink. Thank you – I appreciate your reading! And thank you for your kind comments. Now I need to get busy and read! I am late this week…. Both pieces are treasures. If you hadn’t told me there were two I’d have thought it was two chapters of the same story. Poignant and heartfelt. Well crafted and an enjoyable read. Thank you for the lovely feedback. It does feel like they are related, but when I was writing it seemed like two separate thoughts. I was trying not to squander any of my 100 allocation…. That was lovely, darling. I, too, see no reason why the two cannot be one piece. On rereading them, I see they do flow pretty well together. My original frame of mind had them separated. Cheap at twice the price! Thanks for reading. Thank you, Joanna! I am happy the two for one approach works for you! I enjoyed your introduction and both offerings. Now that my parents are gone, I find there are several things I wished I’d asked them. I especially love the second entry.